Reading and share top 5 famous quotes and sayings about Sagebrush by famous authors and people. 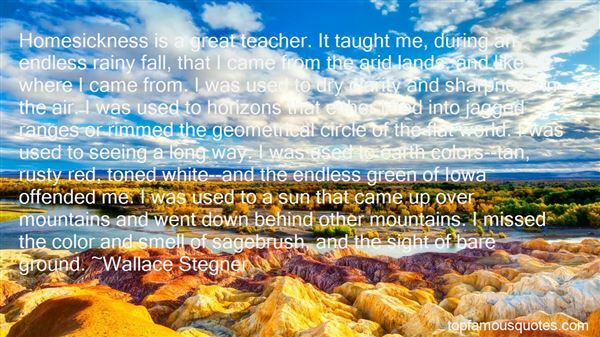 Browse top 5 famous quotes and sayings about Sagebrush by most favorite authors. 1. "The fire. The odor of burning juniper is the sweetest fragrance on the face of the earth, in my honest judgment; I doubt if all the smoking censers of Dante's paradise could equal it. One breath of juniper smoke, like the perfume of sagebrush after rain, evokes in magical catalysis, like certain music, the space and light and clarity and piercing strangeness of the American West. Long may it burn." 2. "Benny took a steadying breath and let it out slowly. "Nix, I do understand what you're going through. I'm going through it too. ""It's not the same thing," she said very quietly. An elk poked its head out from behind some sagebrush, studied them for a moment, then bent to eat berries from another bush. "Then why won't you tell me what it is? "She glared at him. "Honestly, Benny, sometimes I think you don't even know who I am. "With that she turned and stalked away, her spine as stiff as a board. Benny stood openmouthed until she was almost back to the tree where Chong sat with Eve. "What the hell was that all about?" he asked the elk.The elk, being and elk, said nothing." 3. 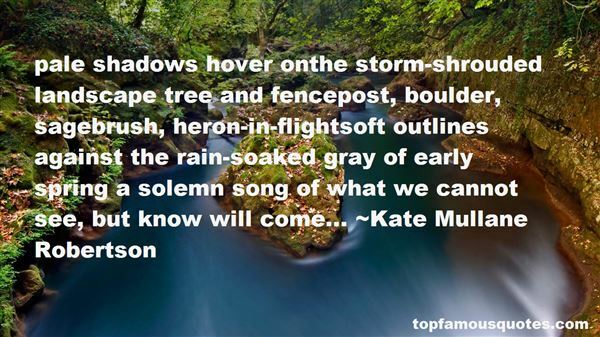 "Pale shadows hover onthe storm-shrouded landscape tree and fencepost, boulder, sagebrush, heron-in-flightsoft outlines against the rain-soaked gray of early spring a solemn song of what we cannot see, but know will come..."
4. 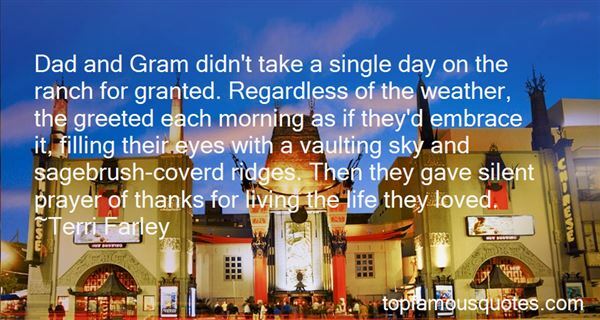 "Dad and Gram didn't take a single day on the ranch for granted. Regardless of the weather, the greeted each morning as if they'd embrace it, filling their eyes with a vaulting sky and sagebrush-coverd ridges. Then they gave silent prayer of thanks for living the life they loved." 5. "Homesickness is a great teacher. It taught me, during an endless rainy fall, that I came from the arid lands, and like where I came from. I was used to dry clarity and sharpness in the air. I was used to horizons that either lifted into jagged ranges or rimmed the geometrical circle of the flat world. I was used to seeing a long way. I was used to earth colors--tan, rusty red, toned white--and the endless green of Iowa offended me. I was used to a sun that came up over mountains and went down behind other mountains. I missed the color and smell of sagebrush, and the sight of bare ground."